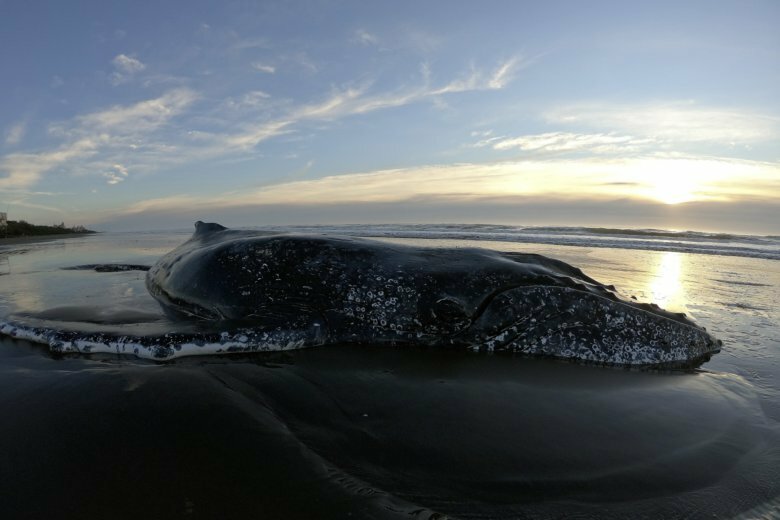 BUENOS AIRES, Argentina (AP) — Authorities say a humpback whale stranded on Argentina’s coast has been sent back to the ocean safely after a round-the-clock rescue effort over the weekend. Dozens of people worked for 28 hours digging around the seven-ton whale using heavy machinery. The whale swam aground Saturday in the resort town of Mar del Tuyu, about 330 kilometers south (200 miles) south of Buenos Aires. The first efforts using a crane to bet the whale back into the sea failed. Biologist Karina Alvarez said the animal floated but did not move its tail or pectoral fins because it was too weak. The waves eventually brought the whale back to the coast again. Rescuers finally used a special harness to pull the whale back into the ocean using a tugboat Sunday.